Before the weather got cold and rainy, a few of us did some end-of-the-year chores to get the meadow in shape before leaving it to its own devices in the winter. With the help of some actual manpower, courtesy of Rafael, we (he) removed some serious sticker bushes (that’s the botanical name, LOL) and hacked out what we call ‘Monster Grass’. Again. This must be the third or fourth time we have tried to remove this grass, but it always reappears. It looks like corn plants when it’s mature and the deer clearly don’t like it. 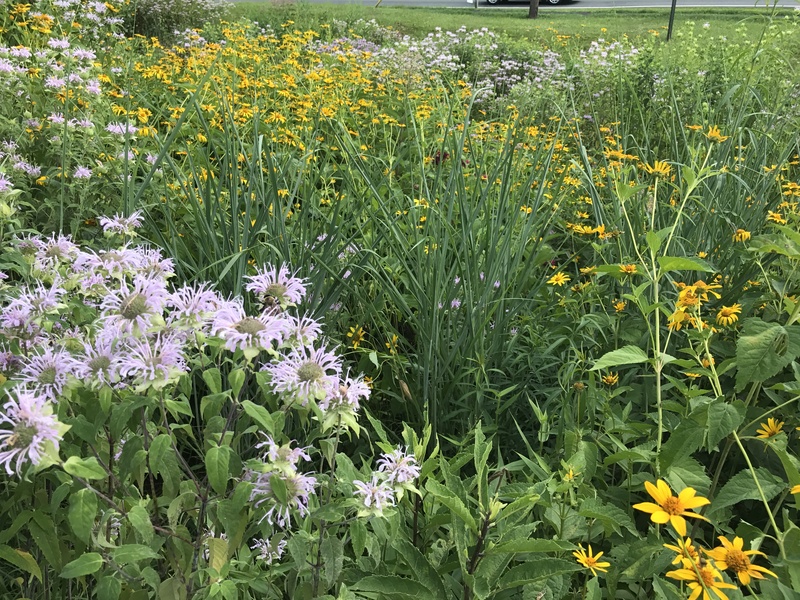 In the cleared patches, we planted two dozen Monarda in a spot near Georgetown Pike, and at least that many asters that we liberated from the over-dense perennial bed across the sidewalk. We put the asters on the slope closest to the building. Judging from their performance in the perennial garden, these lovely lavender flowers should establish a strong colony in no time and maybe, just maybe, choke out any Monster Grass that tries to reappear. We also sprinkled some mulch around the newly-planted flowers in the hope that it would deter weeds from sprouting up until the new plants get established. 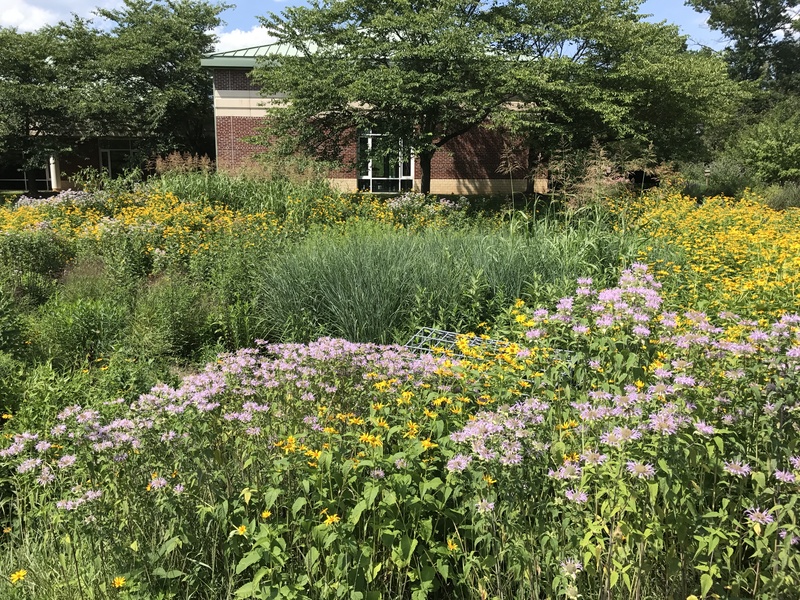 This might be the best summer ever for the library meadow. The grasses we have been adding over the course of several years are finally making their presence known. It should be an interesting fall, with all their tassles peaking above the dying flowers and their autumn colors livening up the brown, dried flower stems for many months into the winter. We were told that it takes three years for grasses to get established because they spend a long time putting down significant roots, and that has certainly proven to be the case here. Planting all those little plugs three years ago was a true exercise in optimism that has finally borne fruit! We were also told that the seeds we planted six years ago would still be viable and would show up when conditions were right, even though they didn’t appear right away. That has proven true, too. There were flowers in the meadow this year that haven’t been evident in the past. Of course, we can’t be sure if that’s because the deer just have eaten them this year for some strange reason or because the seeds just didn’t germinate earlier. Maybe it was the wet spring? Or maybe they were seeds added by birds? Who knows. In any case, there is more diversity in the meadow this year, more color (beyond yellow) and way more grass. 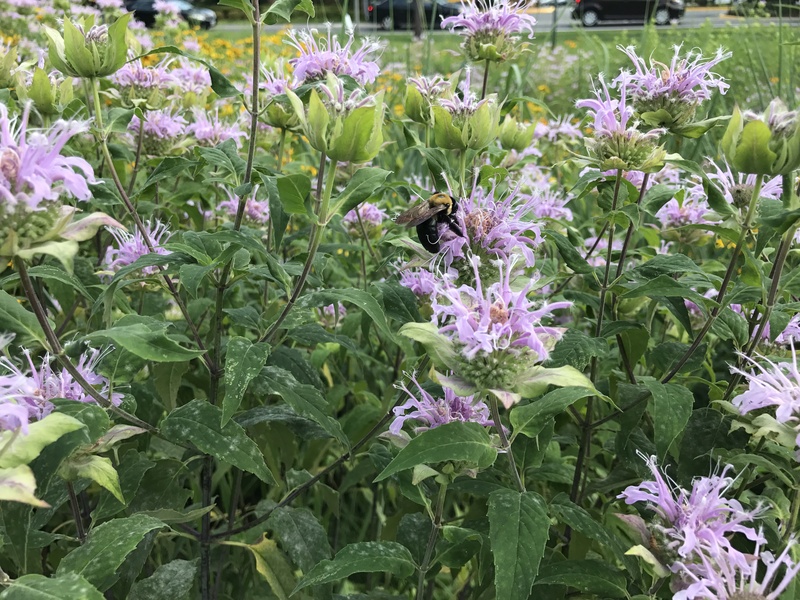 Even a short visit on a sunny day provided visitors with the opportunity to see and hear dozens of bees and other pollinators enjoying the flowers. They were so preoccupied that you could practically stick your hands amongst them and they would ignore you. We have spotted a few Monarch butterflies in the mix as well, which is heartening. Speaking of Monarchs, a local Boy Scout troop recently did us a huge favor while helping one of their members become an Eagle Scout. He was looking for a place to plant milkweed and establish a Monarch Way Station. We were looking for help removing some invasive weeds from the meadow and the meadow is conveniently already certified as a Way Station. It was a match made in heaven. Every place the Boy Scouts removed invasive weeds and a huge patch of what we have come to call “Monster Grass”, they planted milkweed. 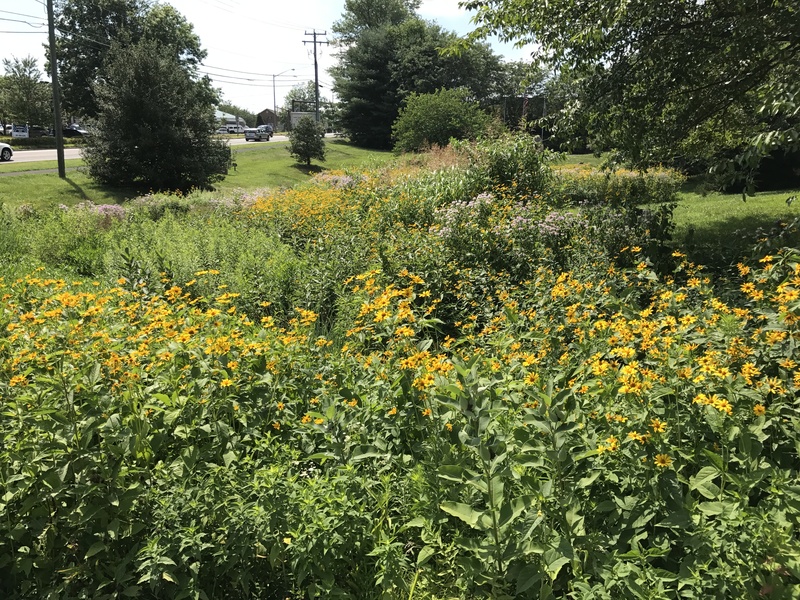 They also cleared a buffer around the ugly stormwater drain to keep the County happy while protecting as much of our grasses and flowers as possible. The newly-certified Eagle Scout has also taken on the responsibility of watering the newly planted milkweed to ensure their survival. This means next year we will have even more of the food necessary for Monarch survival. Yeah! Here are a few photos of the meadow this summer. A growing patch of Mountain Mint. Someone enjoying the bee balm. A large new area of grass on the slope near the sidewalk. Grasses peaking above the native sunflowers. Bee balm that made its way over from the perennial garden on the other side of the sidewalk, plus some of the “new” grass. Grasses shouldering their way amongst the sunflowers. Stopping by the meadow one day in late October, it was a pleasant surprise to see a few lavender asters popping out against the dried grasses and brown flower stems. Large clumps of Mountain Mint were still holding their own and there were thousands of dried flower seed heads waiting for hungry birds to come along for a meal. Lots of milkweed is going to seed (yeah!) and it’s fluffy white “parachutes” stand out amidst all the brown. 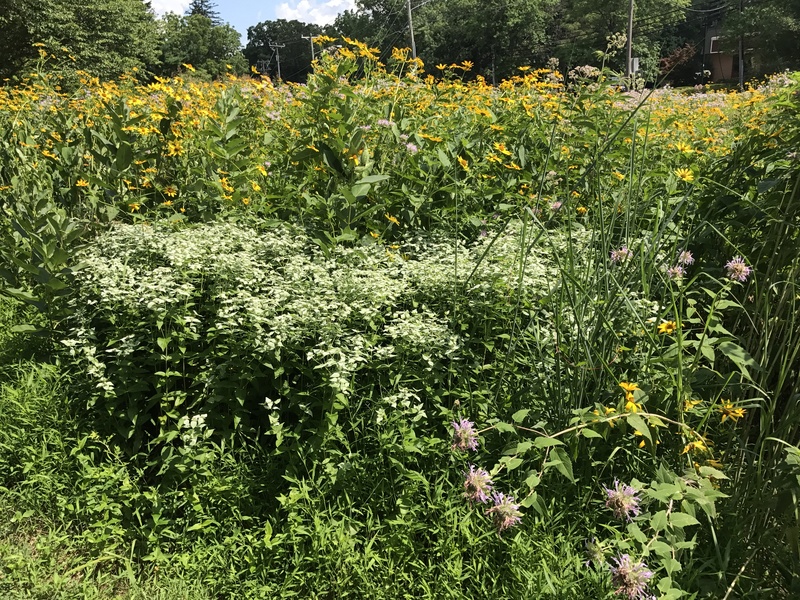 It’s easy to see why the gardener in us wants to cut this all down and tidy it up, but meadow afficionados and environmentalists know that would defeat the purpose. It’s time to honor our wild side and let the meadow do its thing! The plants have gotten so dense that it’s difficult to wade in there during the summer to remove invasive vines or giant poke weed plants, but this time of year it’s possible to see through the dried foliage and fantasize about projects we can undertake early next year. Maybe we can relocate some asters and daisies from the perennial garden to the meadow. They desperately need thinning and the meadow could use the color. Fairfax County recently mowed the steepest part of the retention pond by the sidewalk, probably to ensure adequate drainage during the winter and to allow access for maintenance. This exposes the two ugly drains and a bit of the cement culvert, all of which is nicely hidden by flowers and grasses the rest of the year, but there’s not much we can do about that. While picking up wind-blown trash around the edges of the meadow and all along Georgetown Pike (a monthly routine), it was easy to see where a large animal, probably a deer or maybe two, had taken shelter. It was also easy to see the ground hog holes. Evidently the children who visit the library named the ground hog, who they think is cute, but it would be nice if it moved somewhere else. Those holes are huge! When you drive by the library from now until March, pay attention to the changes in the meadow. All the seed heads will eventually be plucked clean by the birds, the dried brown stems will fall and get soggy under the weight of winter snow and ice, making an insulating blanket for the plants that will explode like magic from the soil next year, and the millions of pollinator eggs laid in the stems will be getting ready for an early spring hatching. There’s a lot going on in there. What exactly is growing in there? It may be hard to believe, but we have planted dozens of different grasses and flowers in the meadow, adding each year to improve the mix. The most visible things are the tall yellow native sunflowers that we’ve taken to calling thugs! If it were possible to wade in there, though, like the deer and other animals do, you would see lots of different plant life. This year, we are hoping the native hibiscus returns and does well on the hillside near the sidewalk. We’re also anxiously looking for the 500+ grass plugs we planted two years ago to make their presence better known this year. Evidently it takes a good three years for them to take off. Fingers crossed! And on May 9, we will be planting more bluestem grasses and a lovely flower commonly called Blue Mist to get more color and plant diversity as well as visual movement. We will also be digging up and potting some of the native sunflowers to sell at the garden club plant sale on May 14. Even though we’ve labeled them “thugs” you shouldn’t be afraid of putting one clump in a sunny spot in your yard. They haven’t spread in the meadow, we just ended up with too many and they are shading out other flowers. They certainly do well in our climate. I plan to put some outside my home office window so I can enjoy them all summer. Winter has finally arrived and the meadow is blanketed with at least two feet of snow. The dead stems of hundreds of oxeye sunflowers are about the only things still visible. Everything is scheduled to be mowed down the first week in March, weather permitting. This will obviously make a mulch of the dead material, but be late enough in the season to avoid killing all the insect/pollinator eggs that have been laid in the hollow stems. So that’s the answer to the perennial question, why don’t we cut this all down in the fall? It is important to wait for the eggs to hatch or we would be defeating one of the important benefits of a meadow. Last fall, a small section of the meadow was cut down for some reason. Maintenance of the drains, perhaps? A simple mistake? We aren’t sure. 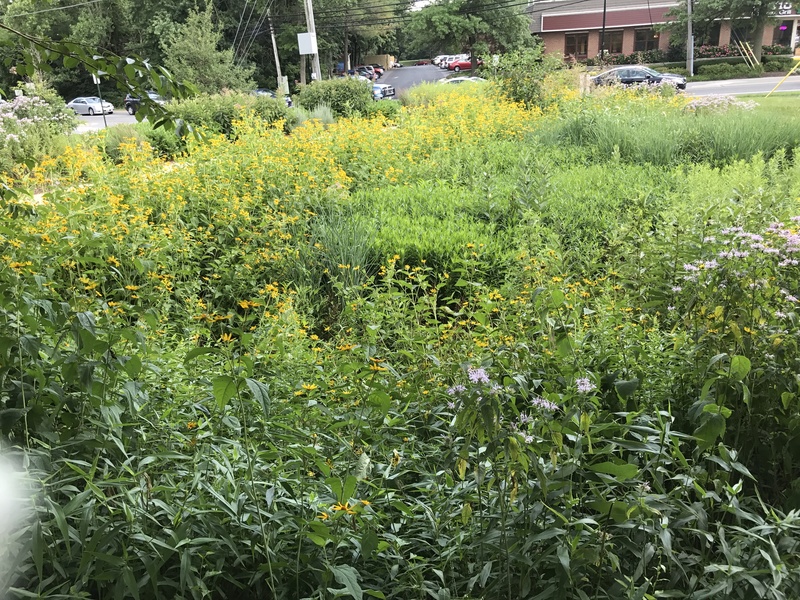 Fairfax County is responsible for maintenance of stormwater retention ponds, which is the location of our entire meadow. We count on them to cut it in early spring, and to avoid cutting it the rest of the year. Who knows. At least it was only a small portion.